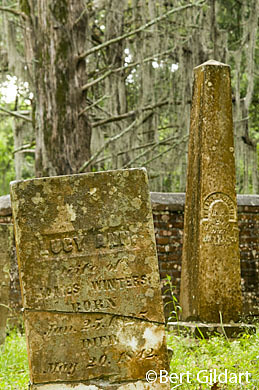 ©Bert Gildart: Kirk Hill of Mississippi is into old things. He’s into vintage Airstreams, antique cars and the exploration of historic places. 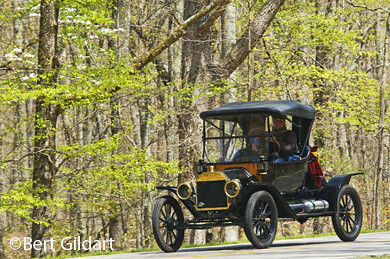 Each year Kirk Hill of Mississippi loads his immaculate Model T and drives the Natchez Trace. Janie and I took an immediate liking to Kirk. First off, I liked his aged-looking hat. But there was certainly more. 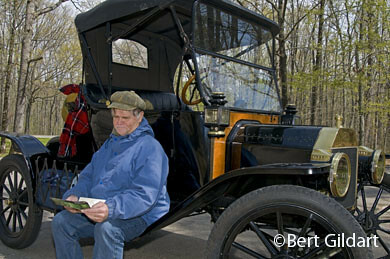 Every year Kirk drives the Trace in a vehicle that is almost 100 years old. His accommodations are modest for he carries all he’ll need for camping in his car and then heads north to Nashville. When he returns home, that means he will have traveled about 800 miles. Kirk has also explored other parks, such as Death Valley, and that’s yet another of our favorite parks. Kirk, now retired from a career teaching school, also mentioned that he was married at an old church along the Trace. Specifically, he was married at Rocky Springs, an historic church that will be featuring a celebration this coming Sunday. Ironically, I met the custodian of the church about a week ago, and he said enrollment had dropped to four, and that he was one of the attendees. The church, however, makes do by hosting special events, and that’s what happening tomorrow, this Sunday. And that’s what caretaker George Cranfield was doing last week when I photographed him. He was preparing the church for a service that will also include antique cars, and that is where Kirk was heading when Janie and I met him-to the beautiful and historic church at Rocky Spring, almost 400 miles to the south. 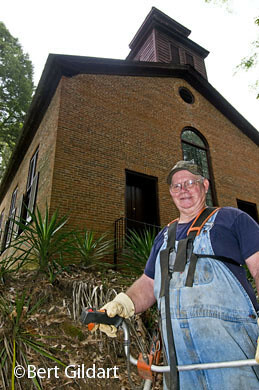 Historic old church is lucky to have George Cranfield as a custodian. Yet another reason Janie and I liked Kirk is that he said he had a copy of our Natchez Trace book. (Now how can you not like a man who has such impeccable tastes?) The book is sold all along the Trace and store managers told us in several places that it was one of their best sellers. Essentially, the work provides numerous photographs augmented, however, with a substantial text. The book is available not only along the Trace, but from Amazon and, of course, from us. The book has been on the market now for almost 15 years and is one we hope to keep there another 15 by making modifications in another year or so, one of the reasons we’re now traveling the Parkway. Another reason is that each trip is an adventure, highlighted by the wonderful people we meet, and exemplified by George and Kirk with his old Model-T.
We exchanged addresses with Kirk and then watched him as he cranked the magneto using the palm of his hand. The engine kicked right off and Kirk stepped onto the running board of what would now be the passenger side, slide over behind the wheel, and, then, with a beep of his horn was on his way. This entry was posted on Saturday, April 18th, 2009 at 4:23 am and is filed under Books & Stories, Glacier National Park, Montana Photography, National Lands, Outdoors, Photography, RV Travel, Travel. You can follow any responses to this entry through the RSS 2.0 feed. You can leave a response, or trackback from your own site.